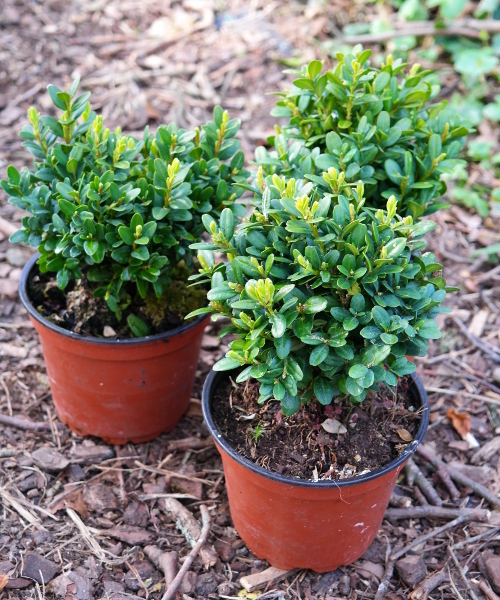 Buxus 'Green Velvet' naturally grows to form a small rounded shrub about a metre in diameter. It has small narrow leaves (10-20 x 5-7 mm) and slow growth of 30-50mm per year. This is a very good plant for low hedging or fine topiary balls. 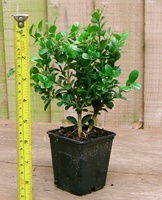 Buxus microphylla 'Herrenhausen' is a slow growing, small leaved plant with a low growth habit. The leaves are about 8-12mm long and 4-6mm wide. The annual growth rate is 10-30mm. 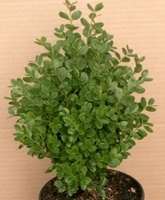 This plant is used for very low hedging, ground cover and for small topiary balls and cubes. Buxus microphylla var. japonica 'Faulkner' is a widely grown plant, with an attractive low compact spreading growth habit. The emerald green leaves are 18-20 x 11-15 mm and the annual growth rate is 80-130 mm. This plant is good for hedging and for topiary, especially balls. Buxus sempervirens 'Elegans' is a beautiful slow to medium growing shrub. The olive green cream/silver bordered leaves are 14-18 x 6-10 mm. The annual growth rate is 20-30mm. This plant is used for hedging and topiary, or as a beautiful specimen shrub. 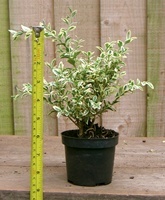 The plants in 9cm pots are particularly wide, dense and bushy, being at about as wide as they are tall. Buxus microphylla 'Golden Triumph' has a slow to moderate growth rate for a box plant and a quite dense bushy growth habit. 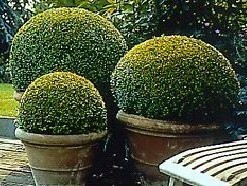 This plant is good for hedging, for example as a contrasting foliage colour to buxus sempervirens 'Suffruticosa' or buxus sempervirens 'Blauer Heinz' in a knot garden, and for topiary, particularly balls. Buxus sempervirens 'Blauer Heinz' ('Blue Henry' in English) is a dense slow growing box plant. The bluish tinged leaves are 14-18 x 6-10 mm. The annual growth rate is 20-30mm. This plant is used for hedging and topiary, especially balls. It has a similar growth habit to buxus sempervirens 'Suffruticosa', and the two plants are suitable for making contracting leaf colours in a knot garden. 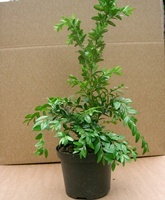 Buxus sempervirens 'Raket' ('Rocket' in English) is one of the fastest growing box varieties. The leaves are about 20-30mm long and 17-25mm wide. The annual growth rate is up to about 400mm. This plant is used for relatively tall hedging and screens. 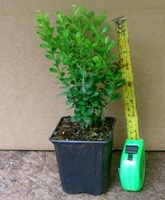 Buxus sempervirens 'Chateau' has persistent green foliage, and a dense, upright and compact growth habit. It is very suitable for low edging and hedges. 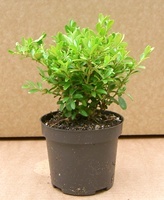 Buxus sempervirens 'Rotundifolia' has large rounded dark green leaves, and is relatively fast growing. 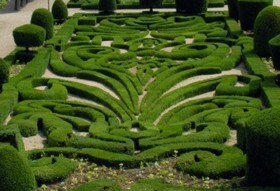 It is very suitable for hedges and large topiary.